Well…. welcome back to school! I have seen almost all of the staff in the last weeks. I have also seen evidence in the school that all of them have returned safely from trips and family excursions to prepare our school! Everyone has put in so much work to prepare our school for the welcoming of its students and KPS families! There are a few preparations we are still waiting on (shelves, some furniture, etc.). Thanks for everyone’s’ patience. We may have over 540 students registered for school this academic season! If we realize this population there could be some change to our registers. Any changes to class lists and structures will wait until reorganization day (Sept. 19th). We will look to maintain as much as we can when a possible reorg. is on the table. I will keep you as up to date as I can. With so much to prepare and do for the first day of school Vice Principal Winney and I want to take one thing off the teachers’ plates (well actually put it on their plate). Staff need not pack a lunch on the first day as we are happy to provide all staff with a Subway lunch. We will have subs and all the fixin’s ready for your first break through second break. We offer staff this lunch in recognition of a great start up, their hard work in preparations and in celebration of another amazing year at KPS. First week events are limited. It is always my intention to give staff the time they need with our students, get to know our groups and to begin our timetable right away. Staff are asked to communicate with each other if you would like to alter the schedule slightly on day one. We get right into the timetable so we can trouble shoot any issues heading into reorg. day. Our students know who their teachers are and where their classrooms are. Some may have forgotten. Please make the time to circulate on the playground starting at 8:50 am on Day one, classlist in hand just in case. Welcoming our families and students on the playground is always a great way to start the year. Those teachers without homerooms can circulate as classes begin and make sure every single student feels welcome and part of our amazing school (especially our newest faces). The most important thing is to be kind. Collaborative, supportive and positive school culture depends solely on the bonds of interrelational trust within and among all stakeholders. Learning depends on opportunities to think, do, assess and repeat. Our primary purpose as an organization is to provide learning opportunities for all. Learners at KPS will leave each day better prepared, happier and more confident than when they came. We will learn about, from and with each other every day. The way we treat each other and our students is the way our students will treat each other. McKena, Zoe and Gavin in back to school garb and pose wish you a great day one! Welcome Back to Kingsville Public School Everyone. . . So you have a plan to unveil a school blog page for the start of this academic season. . .
Now your question might be: What is the best way to inform our families that it will be our primary communication portal? Word of Mouth. Have a few contests where the kids login and answer some questions in the mornings. The info they need to answer can only come from the blog. Better yet, have them leave their answers on the blog as a comment and award a few winners each morning for a couple of weeks. This will wear off eventually so be careful with the carrot at the end of this stick. You want the reward to attract them to the blog and once there the information has to be rich in order for your visitors (parents and students) to want to come back. Get a digital club together and make sure the kids are talking the talk. 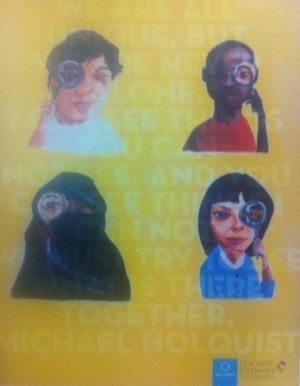 Have them adorn the hallways with posters. Make sure there is a Digital Club blog to go with the school blog so that kids are attracted to the work of their counterparts. Make sure you are embedding Dig. Cit. into your days as someone will test the boundaries and make some faux pas. That is okay. It is all about the learning. Careful…don’t want to scare them away with punishment, on the contrary you want to attract them with learning. A Facebook and Twitter account with a brand page or school page helps and be sure to link both to your blog. Facebook will get your blog in parent circles the fastest. Decide on a strategy ahead of time for dealing with comments. Moderating comments maybe the best way to go in the interest of preserving everyone’s Digital Footprint. Better to have a moderated comment to talk with a student about rather than a public one. After a meaty discussion on Dig. Cit. allow the student to then make the decision about whether the comment need be public or edited. Interpretation learning is always so rich. When students and parents see their comments they are empowered to join the conversation. Use the school sign to advertise the blog address all year! 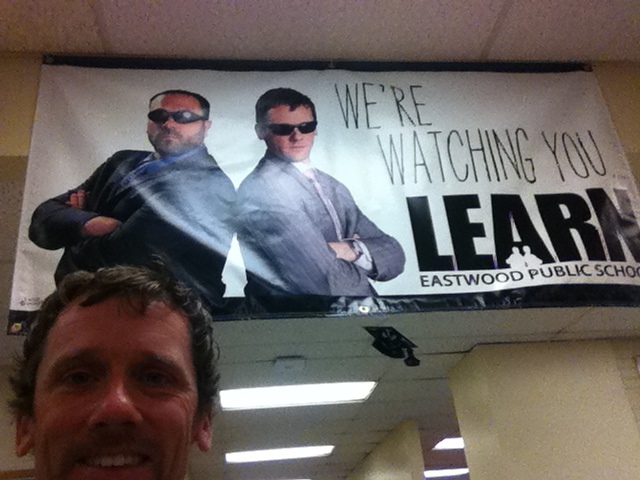 Order a large banner from the school photographer if you don’t have access to a school sign. They offer these for free with your yearly contract. Send a newsletter until January and advertise the blog in every issue on the front. Let the community know the timelines. Give the Whys of the Blog: eco-friendly, fiscally responsible, up-to-the-minute, always available, more interactive, read/write, etc. Keep your posts up to date. The longer they are stagnant the more readers you lose. Keep your posts short and tidy. Don’t be afraid to move beyond information items and include some important stuff on the blog with decisions to be made. Increase the value of the visit. Add pictures to all of your posts. Make sure all consents are up to date and signed! Call parents when you are showcasing or naming a student. This double redundancy is so appreciated by parents and puts safety and courtesy first. Adding the Flickr widget is a great help especially when combined with the iPhone app! Add polls to some of your posts. Let the community vote on some items. Add video to some of your posts. Keep them short and to the point. (My first couple “From Mr. Cowper’s Desk” were dreadful! Too long and wordy. )–you need a safe YouTube channel to do this right. Allow students to contribute writing to the blog. This increases your word of mouth traffic. Enable the Post from Email function. This allows you to update from anywhere with no app required. Make sure parents can subscribe to the blog via email. Install the WordPress App on your iPhone. This way you can quickly and quietly fix spelling errors or delete posts. Put the blog address everywhere. Let the community know that this is where the stuff is and if they aren’t reading it they are missing out……not in these words of course…you get the point. Use tags! This will help your readers find the blog when they lose the address. They will lose the address. Make sure the blog has the school name in the address and make sure you tag with the school name each time. Think Multimedia: video, pics and audio. Audioboo is another great little iPhone app that lets you add real-time conversations and audio from around the school with three clicks! Add a Clustr-Map widget to the blog to track visitors. I hope these ideas help you increase your communication level with your school community. Enjoy the analytics that WordPress offers. This will help you track the most interesting posts and the times that your blog is used the most. Happy school blogging in 2012-2013 everyone! If you have other ways that you have increased the school blog use please comment! I saw my first “Back to School” commercial yesterday (July 26) and the How Soon is Too Soon question popped in my mind. Here in SWOntario we don’t start school until September 4th. I digress. 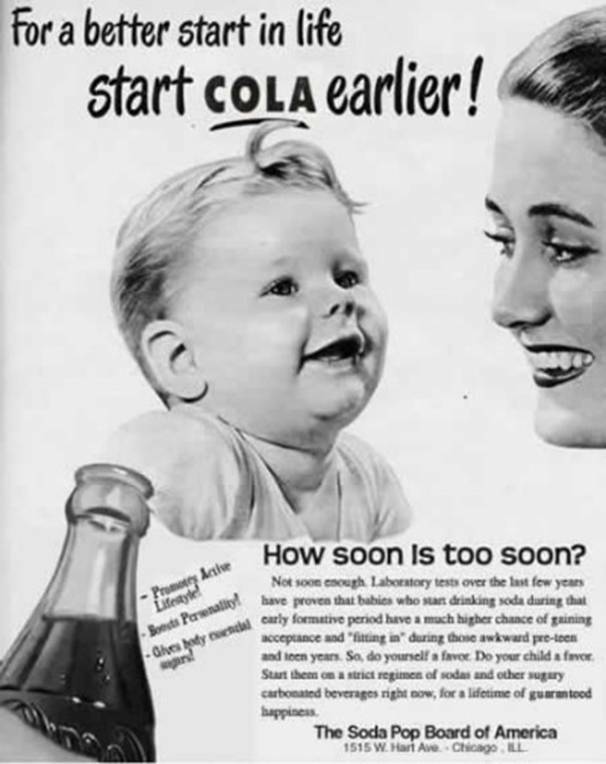 This ad claims that “laboratory tests, over the last few years,” have shown that babies fit in better during those awkward pre-teen and teen years after drinking cola. Hmmmm…..my math isn’t that bad. say “they mark too easy” when referring to colleagues whose students excel? give a student a grade a week later, a month later, never? think a grade is feedback? ban handheld devices in your classroom? show movies on the SmartBoard? believe social media is a fad? believe the best learning environment is a quiet one? demand (parents) or give worksheets (plural) for homework? blame the teacher, the administrator, the parents, the students, the school district or rock and roll music…etc. 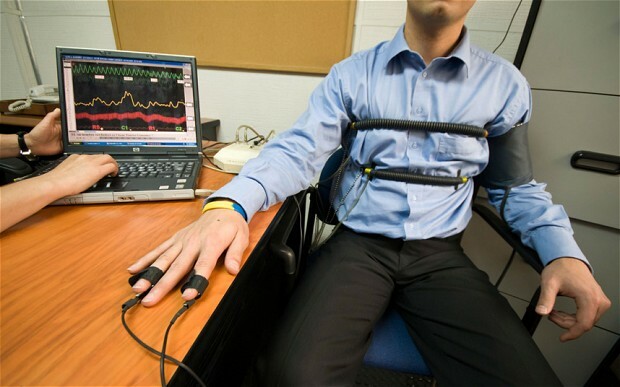 Now, do you know what the research says about these practises? Does it align with your thinking or challenge your thinking? It is time to learn something new. Step out of the comfort zone and into the learning zone, the risk zone. Take a learning stance. Find new research. Heck, develop your own research out of an inquiry. Yup…there it is. The magic word. Change. Do you believe they used to allow ads like the one above in magazines? They also used to smoke on airplanes, have back seats, with no seatbelts, the size of Montana, give children bottles of ink and a fountain pen? My gosh…the Principal used to use a strap to teach learnin’! “They” is actually we. We have segregated our schools, isolated our most vulnerable students away from schools, assimilated the culture out of our students and myriads of other draconian practises that kept us from being true learning institutions. Institutions with a culture where the most important learning was about ourselves, about our interconnectedness with the earth with each other (our kids) and about learning. This year connect. Research shows that, good or bad, the greatest and most impactful aspect of a student’s life (no matter the grade) is their teacher. Connect with them. Learn with them. Know them. What is a Critical Friends Group? Below is an exerpt from the School Reform Initiative’s website which defines a Critical Friends Group. This is the institute I attended in Alpharetta, GA in July 2012 lead by Dr. Thomas VanSoelen (@tvansoelen). I attended with the professional learning intention of building my facilitation skills. I left understanding that I had done so through exercising and practising my participant skills. CFG builds the learning capacity of the group by engaging members in significant work in an environment that supports risk taking. To make it more likely that learning in CFG will build the group’s capacity for transformational learning, several key elements are essential. Groups are voluntary and sustained. A critical friends group is made up of a group of six to ten educators who meet regularly, perhaps every four to six weeks, over a sustained period of time. Membership is often voluntary. Voluntary participation helps to increase the likelihood that the members are committed to taking on risky and challenging work and staying engaged over time. Similarly, CFGs continue to work together beyond the completion of a particular time cycle such as a semester or school year. A skilled and experienced facilitator or coach supports the group. The coach, who frequently is a member of the group who has participated in professional development to develop the skills, strategies, knowledge, and dispositions to facilitate the group’s learning. Groups use protocols to build their capacity for learning. The disciplined use of protocols or agreed upon processes and structures helps the CFG build its capacity for learning. Protocols help sustain a steadfast focus on teaching and learning. And, they offer the structure that allows a group to deprivatize their practice and explore the most difficult and challenging issues of insuring that students experience educational excellence. Since I have returned I have officially started a CFG. 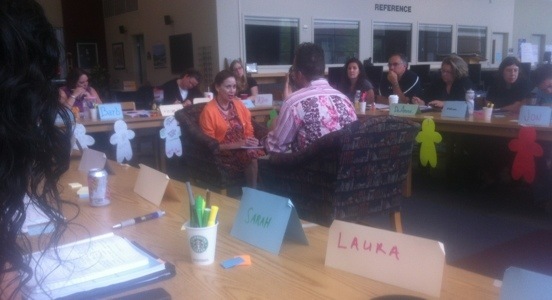 11 amazing administrators volunteering their time, trust and academic energy to learning and leadership reflection.